uPVC Bay and uPVC Bow Windows from Bolton Upvc Windows are attractive features on many homes which can also be added to your property by converting a flat window .They can make a huge difference to any room, making it seem much bigger and brighter due to the increased light these windows let in. Our UPVC windows, uPVC Bay Windows and uPVC Bow Windows or Upvc Bay Windows are constructed using standard slimline window frames which are connected using structural bay pole or post assemblies. The external cill, which the frames sit on, is welded together and polished smooth to create one continuous cill below all the frames with reinforcement inside to keep the cill straight . 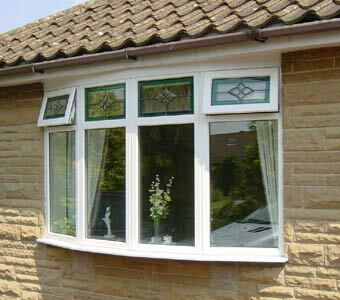 We specialise in replacement double glazing bow and bay windows from 2 to 7 segments . Including conversions from flat windows all fitted to such a high standard that your property will look as if the windows were installed as a part of the original building. Under new Uk building regulations load bearing bay and bow windows special load bearing bay pole jacks must now be fitted through the external sill into the bay pole assembly kit. 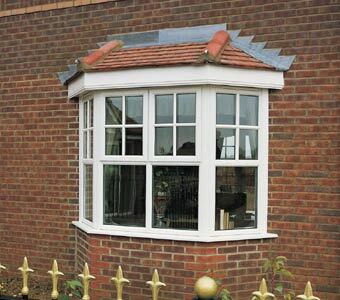 This creates a structural support from the brickwork under the bay or bow window to the head of the aperture. You can have any sort of design including every type of angled or square bay, to bow window conversions which provide a pleasing curved alternative to traditional flat frames giving a sense of added space and light complete with new roof and internal window board .